Matt Streuli: A week of thingy things! Oh, and I've picked a fight with Virgin Media. I'm Matt Streuli and welcome to my comedy/mental health/ General Election blog thing. We will start with the depressing stuff. In good news I finally have a referral appoint onto the next stage of "NHS Mental Health Services: The Game". I called up (which takes some courage building for me) as I had heard nothing for a month to be told a letter would be in the post so I would get an appointment in May. No rush... Surely it is cheaper for the NHS to pro-actively treat mental health rather than waiting for it to escalate into an emergency? Perhaps something to bear in mind when you go to the polling station. I finally sat down and went through my Facebook; untagging or deleting videos and pictures which I don't want the world to see. Claire's advice at our last girly night was to cleanse the stuff with old girlfriends which I found quite hard to do. On one hand, it is sad that these memories will never happen again and I am not as happy as I was back then. On the other hand, it makes me think what evidence I will leave behind when I die. If you follow me on twitter or instagram you will see that I take ALOT of pictures. Some of them because they look good or could be used as poster backgrounds or in my youtube videos. Other pictures and videos I take because I worry that when I die, there will be no evidence I ever existed. I really don't want to live forever, I barely want to face another five years, but will I just be forgotten about? I really upsets me to think that no one will notice. I take photos so people will remember the here and now and I hope they will get the best of me whilst I last. So with the polls opening in less than 14 days, the parties are having their final push to grab voters. However, it is almost universally agreed that there will not be an outright winner. This does make your voting choice slightly more interesting. Do you vote for the main party, who if they have a big enough number of MPs will form the main slice of the government? Or do you vote elsewhere to make sure a smaller voice is heard is louder? Do you trust Labour or Conservatives to run government by themselves? Can you in fact trust any polictican!? The General Election is the biggest reality TV show in history and given how vital it will be to your wages, your NHS and your country over the next FIVE years it is important you weigh up your options. This is something we regulary discuss on our Comedy/Current Events podcast Off The Radar. On one recent show, each of us took an online test to see whose policies matched our opinions. I generally called myself a conservative (I just felt they were the least worse of the choices) but actually my views match closer with the Liberal Democrats. Now I would like to keep my blog relatively balanced but I am not the BBC, so I can say that I would rather than a Conservative/Lb Dem coalition again. We know it works, and I trust them more than I will ever trust Labour after the Blair: The Illegal Wars years. 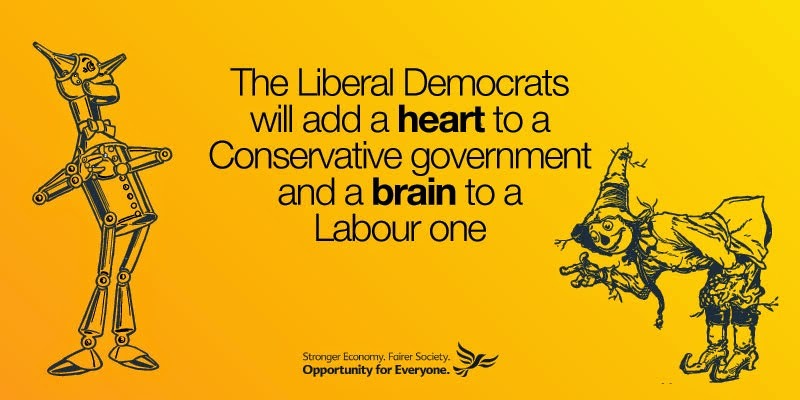 The below poster accurately sums up my feeling; by themselves I do not trust any party to rule but with a Lib Dem minority keeping any plans moderate – it might just work. Imagine how bad the cuts and the tution fees would have been if Clegg and co weren’t there and the Tories could do as they want?!? HOWEVER, I must also remember that your vote matters on a local level. As a Slough resident, this is a safe Labour seat so my Lib Dem vote won’t actually matter. In fact on a local level, perhaps I should vote conservative as they have a better chance of beating the Labour MP? In nearby towns of Iver and Iver Heath, they are part of the safe Conservative seat of Beaconsfield. Recently, former Tory Prime Minister John Major told Scottish voters to all vote Labour so they would stop the SNP! So do you vote for what you agree with? Or do you vote where your vote will have the most clout? Aside from a scary ghost walk of a rather beautiful Hemel Hempstead which part of me enjoyed even though I spent most of the time hiding behind Falcon & Emily from the corpses; I picked a fight with Virgin Media. Even now, they are advertising a free Samsung tablet when you join their 'Big Bundles'. The Facebook advert is below. NO WHERE on the page does it say that the Big Daddy or Big Kahuna is part of the 'Hottest Ever Sale' but they are part of the Big Bundles. In the terms on the webpage for the Free Tablet it does say QUOTE "Hottest Ever Sale: New Customers Only". But as I have explained in my formal complaint and on their facebook advert that I am asking to upgrade to the Big Daddy deal which is part of the Big Bundles... Unless their advert & website is false and misleading they should upgrade me to the offer and send me a free tab? Right? Finally a video to finish on of my little sister which I found in my Facebook cleanse. Thank you for all the feedback and comments on twitter - please keep them coming and keep sharing my blog. I am writing with regards to the advert which appeared on my facebook offering a free tablet when signing up Big Kahuna or Big Daddy. There is nothing on the Facebook advert or the banner of the page that says either of these are exclusive to new customers. It does say in the terms at the bottom of the page that the “Hottest Ever Sale” is for new customers but as per my screenshot below it appears that the free tablet is with the Big Bundles. There is nothing on the page about the “Hottest Ever Sale” except for the terms. Please see my attached conversation with one of your staff earlier today. I would like to upgrade to the Big Kahuna and receive a free tablet please. If you refuse to do so, then you website and facebook advert is therefore misleading and inaccurate. I would then be forced to make formal complaints with OFCOM, Trading Standards and the Advertising Standards Agency and consider moving my custom to a competitor who can proof read. Free tablet with BIG BUNDLES? Where does it sale new customers? Where does it say Hottest Ever Sale? As an existing customer how do I upgrade to Big Kahuna and get a free tablet as I saw on my Facebook?? It doesnt say that on the page. so I want the offer please. Otherwise the advertising is wrong - shouldn't it say free tablet for new customers? So how do I get the offer? 17:17:12Matt Streuli:Please can you show me where on the website it says this? 17:22:42Matt Streuli:But there is nothing on the Big Kahuna page that says it is part of the "hottest ever sale"
and it does not say on the advert that the tablet is part of the "hottest ever sale"
Therefore, I would like to upgrade to the Big Kahuna and get a free tablet please. Please can you provide the email address where I can make a formal complaint please? 17:25:47Dnyanesh:To chat with our Complaints team, please visit http://www.virginmedia.com/contact, and then select the option 'Make a Complaint'. 17:25:58Dnyanesh:What else can I do for you today? 17:26:36Matt Streuli:That is everything. Thank you for your help. Please can you mention this to your line manager as I will be sending this chat with my complaint? PLEASE READ AND COMMENT ON THE REST OF MY BLOG! !